It is truly baffling to me when atheists want to "give" Hitler to Christianity. And they do it with gleeful self-humiliation. "Why is it self-humiliation, Cowboy Bob?" Most atheists that I have encountered, especially on the Internet, fallaciously declare themselves to be the intellectual elite, simply by virtue of being atheists. (Ridiculous, I know.) Yet these bastions of enlightenment commit logical fallacies freely and frequently. They also do not know how to correctly identify fallacies. 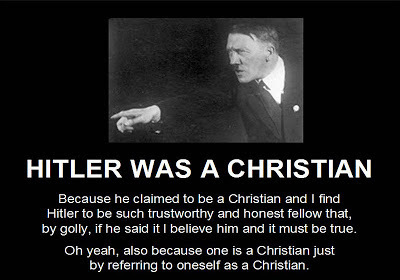 Hitler supposedly claimed to be a Christian (but his "Christianness" is easily refuted). When a Christian says, "Hitler was not a real Christian", the misotheist will scream, "AHA! The 'No True Scotsman Fallacy'". Except that he's dead wrong, and has embarrassed himself by incorrectly attempting to use a logical principle. Remember, don't fear the atheist. They have a great deal of bravado, but even a cursory knowledge of logical fallacies will show that there is nothing behind their bold talk. But back to what I was saying before: Atheopaths want to "give" Hitler to us. What do they hope to gain? Just like their constant but pointless attempts to demonize Christians, there is no benefit to a discussion. It does not prove anything. Oh, sure, I know some really nutty atheopaths who are so stupidified by hate and demonic influence, their logic goes like this: "You are a bad Christian, even though I hate all of you. So was Hitler. Therefore, Christianity is false. There is no God!" Yeah, pathetic, innit? So anyway, I wanted to share this video illustrating the "No True Scotsman" fallacy. You, too, can see how people who use it are only embarrassing themselves with their lack of knowledge.